‘Decadence always really translates’ was the day’s touchstone. 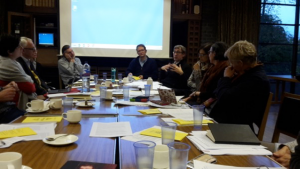 Scholars and translators from France, Spain, Italy, Denmark, Germany, Britain and the US had gathered in Trinity College, Oxford to discuss translation and Decadence studies. How can Decadence be taught to monoglot students? The transmission and exchange of cultural texts is so central to Decadence – be it in literature, painting or music. Can it be studied under nation-specific frameworks? And what to make of translation as theory versus translation in practice? Two plenary speakers, Emeritus Professor Clive Scott and Professor Ann Jamison (University of Utah) focussed on the British reception of French Decadent poetry. Professor Scott emphasised the importance of suffusive prosodic effects in translations of French Decadent poems by Arthur Symons, John Gray and Ernest Dowson. 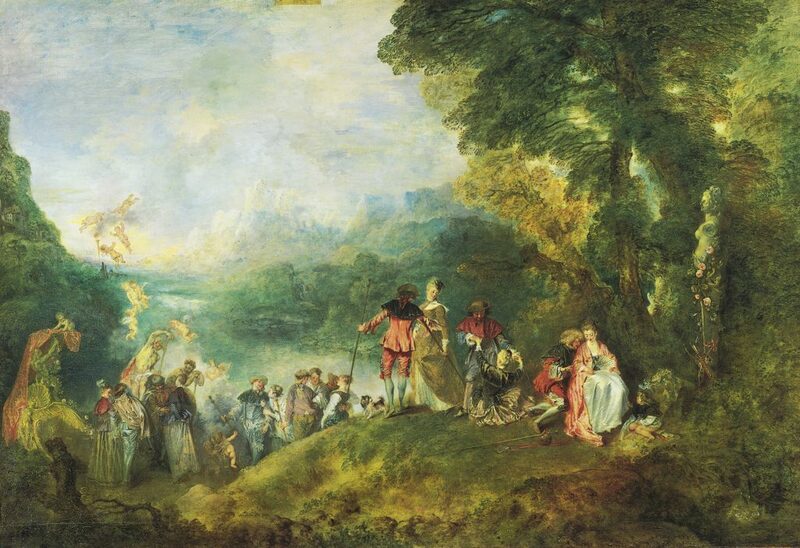 Professor Jamison explored a chain of cross-medial ‘transfigurations’ of Watteau’s painting ‘L’Embarquement pour Cythère’ (1717) in poetry by Paul Verlaine and Michael Field. A series of case studies illustrated the interdependence of Decadence as an aesthetic and network, facilitating exchange. 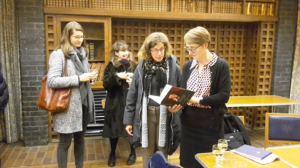 Professor Jane Desmarais (Goldsmiths, University of London) explored the challenges of teaching Decadence across languages and artistic forms, from poetry to visual art and music. 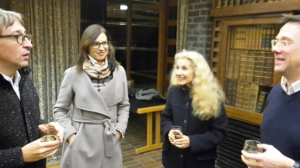 Professor Maria Del Pilar Blanco (Trinity College, Oxford) discussed ‘modernismo’ in Spanish American literature between 1880 and 1920, exploring the cosmopolitan Latin American community in Paris at the fin de siècle. Spanish translators of French Decadent texts decentred global modernism, she argued, with important political implications. And I presented findings from my own recent doctoral work on the German poet, Stefan George, discussing his translations of three poems by Ernest Dowson. It is little known that these two poets met through Aubrey Beardsley when George stayed in London in the 1880s; George was one of the few authors and translators to popularise British Decadent poetry in fin-de-siècle Germany. The third part of the day was dedicated to theoretical texts on translation. Professor Matthew Reynolds (St Anne’s College, Oxford) introduced Naoki Sakai’s deliberations on translation and subjectivity. Sakai takes the example of Japanese-English literary exchange in order to challenge presuppositions about the monolingual readership of translated texts. 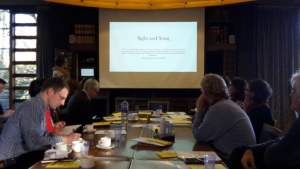 Juliette Taylor-Batty (Leeds Trinity University) used Lawrence Venuti’s The Scandals of Translation to raise questions about the subversion of authorship and scholarship in acts of ‘linguistic theft’. And Professor Guy Ducrey introduced work by Jean de Palacio and Marie-France David pointing back to the Latin roots of Decadence. These texts stress the necessity of comparative approaches when studying and teaching Decadence. 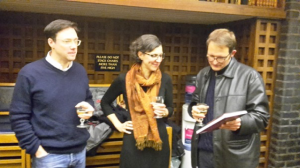 The day concluded with a book launch of Arthur Symons: Poet, Critic, Vagabond, by the editors Stefano Evangelista and Elisa Bizzotto. The essays in this volume present Symons as an important mediator (and indeed translator) of European Decadence. And a glass of wine was a lovely way to finish off the event! Bearing in mind the importance of oral and visual transmission of text, the network’s next event is dedicated to Decadence in performance. In collaboration with the Rimbaud and Verlaine Foundation, the next event presents readings from the work of Charles Baudelaire, Paul Verlaine, Stéphane Mallarmé and others. Many of these poems were set to music by the likes of Debussy, Strauss, and Schönberg and indeed in their poesy emulate rhythm and musical patterns. So watch this space for more information about the event on February 12th at Senate House, London.